Some things in life just go together naturally and that’s why many people think that CBD and Coconut Oil are plain and simply a match made in heaven. CBD Coconut Oil is the latest craze to hit the world of CBD and there are some very good reasons why. Coconut Oil has been touted as being extra healthy for humans for many years now, and much of that is down to what’s called MCT’s or medium-chain triglycerides. This is a fatty acid that can be absorbed directly into the portal system and is considered to be a great addition to a healthy lifestyle. Coconut Oil has an extremely high concentration of fatty acids, also known as saturated fats, and these fats make Coconut Oil a perfect binding agent for CBD. While Olive Oil contains only around 20% fat content, Coconut Oil contains more than 80% fat, and these fats are considered by many to be key to heart health as well as a range of other positive benefits. That said, Coconut Oil is more or less the perfect conduit for CBD extract and provides better effects for the user. CBD Coconut Oil also has other health benefits attributed to it. Lauric Acid for example – present in Coconut Oil – creates a monoglyceride that acts as an antimicrobial. This makes Coconut Oil a far better match for CBD than any other substance, and it’s also completely vegetarian and vegan-friendly. This also means that Coconut Oil is the best medium for CBD as it remains solid at room temperature and that makes it perfect for use as CBD Topicals for the skin. The solid state also means it can be produced in easy-to-use Gelatin Oil Capsules for making your own powerful CBD Capsules at home if desired. The other great benefit of CBD Coconut Oil is that it won’t degrade much over time and enjoys an extremely long shelf-life. Once you have your highly-refined Coconut Oil you can go ahead and simply infuse CBD into the mix by a process known as decarboxylation. 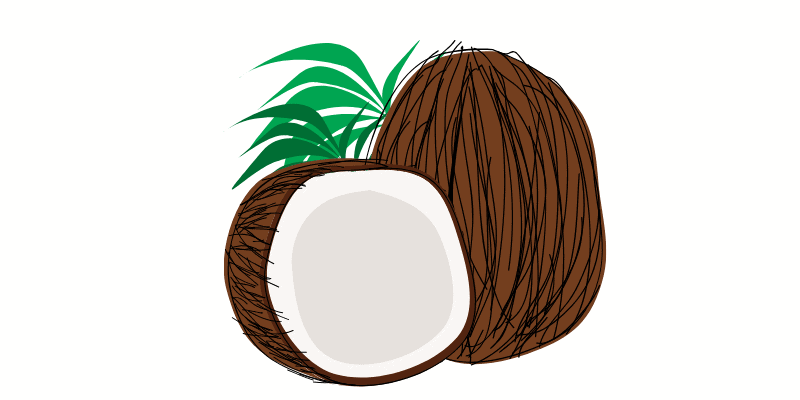 Coconut Oil is also relatively cheap and tasty and can be used for cooking, skin care and many other things to boot. But when it comes to buying ready-made CBD Coconut Oil it can be tricky to navigate all the products online. That’s why we are bringing you the two best CBD Coconut Oil products anywhere on the internet, and they are also available at a great price. 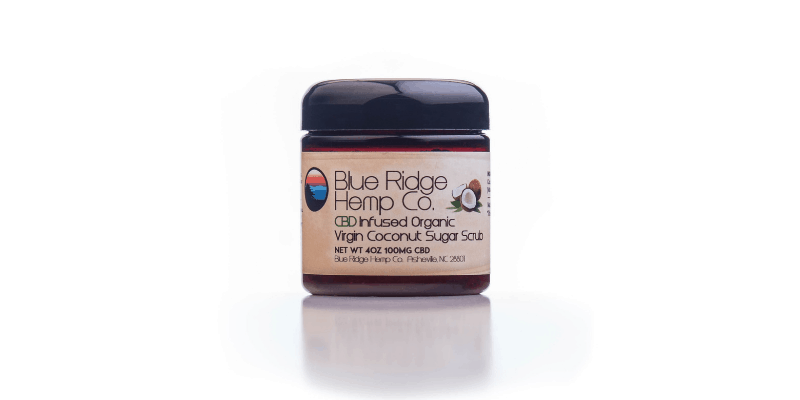 Blue Ridge Hemp is a company who are passionate about CBD. Their mission is to rid the world of pain and they believe that for many people CBD is where’s the answer lays. Their mission statement discusses the fact that 100 million adults in the US suffer from pain and that has a devastating effect on many lives. As such, Blue Ridge Hemp’s mission is to aid in filling the gap for people who suffer from pain and want a natural and non-toxic solution that can work for them long-term. Cannabis and its compounds have been used for centuries to treat a range of conditions including insomnia, anxiety and of course pain, just to name a few. Fairly recently, scientists in Israel discovered that one compound inside the cannabis plant that is considered to have all the health benefits is CBD. CBD is completely non-psychoactive unlike its big brother THC – the compound responsible for getting you high. CBD also has no habit-forming effects and is thought to be completely non-addictive. Blue Ridge Hemp use only the finest Industrial Hemp derived CBD and expertly combine it with other ethically and sustainably-sourced Terpene-rich botanicals. Their CBD Coconut Oil is flavored with only the most natural and high-grade Coconut Oil base. That is mixed with the best CBD and the result is a topical that has numerous therapeutic qualities. It is also extremely versatile and can be used for a range of different uses. While many people already favor cooking with Coconut Oil instead of Canola Oil or Butter, there are those who also want to receive the great benefits of high-quality CBD at the same time. Blue Ridge Hemp is one company who noticed this gap in the market and that’s when their amazing CBD Coconut Oil was created and perfected. The 8 oz container is packed full with 250mg of CBD which translates to roughly 15 mg of CBD per serving. This product is 100% dairy free, gluten free and suitable for vegans. The other great thing about the Blue Ridge Hemp CBD Coconut Oil is that it contains 99.7% pure CBD Isolate and packs a serious punch just when you need it most. The contents can be used to cook with, spread on bread, or even smeared on the skin to deal with a variety of different skin conditions. Lazarus Naturals have been in the business of CBD for a while and was founded on the belief that CBD should be easily accessible, safe and cost-effective for the people that need it most. The whole team over at Lazarus are on an “employee-owned” basis and that makes them a passionate crew who work hard for a living. They also put on outreach and assistance programs, providing 60% discounts on their products for veterans, individuals on long-term disability and for low-income households. For the team at Lazarus Naturals, nothing is more important than a healthy, wholesome lifestyle, and their great range of great quality CBD products provide just that. While Lazarus Naturals don’t sell a huge range of CBD products, they prefer to focus in on the quality of the products they sell. Their CBD Tinctures are second-to-none, as is their Soothing Mint CBD Balm. However, their CBD Coconut Oil is a cut above the rest and something well worth looking into. As CBD is known to help many people to get a good night’s sleep, it also supports general health as well as things like joint function and leaves many with a feeling of tranquility during a busy day. 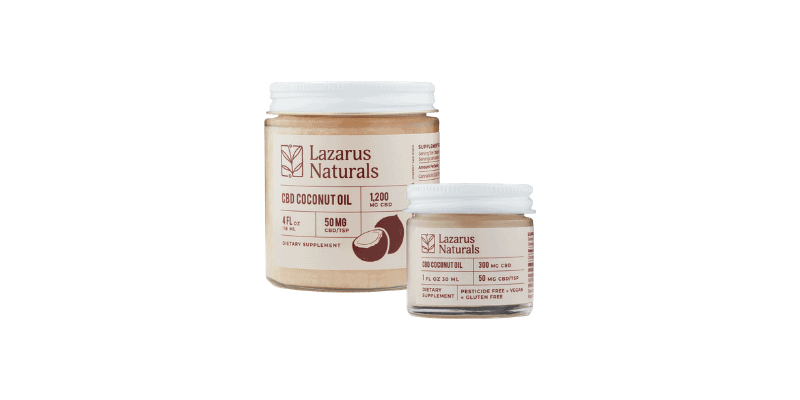 Lazarus Naturals CBD Coconut Oil is made with Full Spectrum Hemp Extract and contains approximately 50mg of CBD per teaspoon. This product is gluten free and suitable for Vegans, with no artificial flavors, preservatives or sweeteners in the mix at all. Lazarus recommends that it can be ingested or used topically depending on your needs and takes up to two hours for full effects to kick in. Lazarus Naturals formulate their CBD Coconut Oil in a specially-dedicated state-of-the-art facility, using a vertically integrated process that delivers best results every time. What’s even better is the fact that Lazarus Naturals have all their CBD Isolate tested by a third-party – testing for potency, pesticides, as well as, heavy metals. When it comes to quality, Lazarus Naturals is a trusted name in the world of CBD and have many positive customer reviews offering five-star ratings. If it’s quality CBD Coconut Oil you are looking for, look no further than Lazarus, and rest assured you will receive a top-quality product with amazing customer service to back it up. CBD Coconut Oil is becoming a staple for many people into a healthy lifestyle and nutritious eating. It can be used in cooking or spread on bread, and can also be used as a topical on the skin.